Gardening gloves are an indisposable part of any gardener’s kit, and they have numerous purposes. Apart from keeping your hands warm and cozy in the winter, they will also protect you from those sharp thorns and spikes, that so often wait somewhere in the garden. Finally, good garden gloves will keep your hands from getting dirty, so that’s that. We’ll delve deeper into the diverse and colorful world of gardening gloves. This group of products is so diverse and heterogeneous, that we’ve changed our modus operandi. 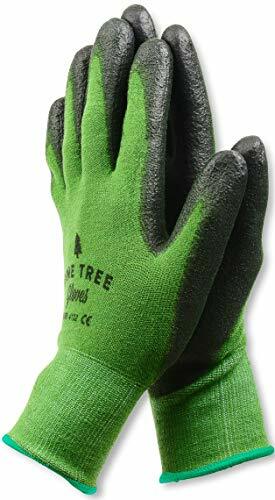 Instead of simply enumerating the 10 best gardening gloves, we will mention only the best ones in particular categories. Gloves for thorns, or rose pruning gloves are the best when you need to work around some plants that have a lot of little (or big!) spikes that can hurt you. This particular model has a long cowhide gauntlet that stretches up to elbows so you won’t have to worry about your forearm getting cut or scratched. The gloves are made from 100% natural goat grain, so as to ensure the maximum resistance to punctures. Yet, this doesn’t hinder these gloves from also being flexible. They allow for a certain level of dexterity, so you’ll be able to do all those little and intricate tasks, even with your gloves on! Thumbs are specially designed to provide the maximum comfortability while keeping the good grip, which is important when you handle some garden tools- manufacturers state that it’s good for people with arthritis. On the inside, these gloves are extremely soft and cozy. This is the case thanks to lanolin that keeps your hands moisturized and their softness intact. So, even if you have sensitive skin, you won’t have to worry about these gloves causing you some irritations, etc. These gloves possess what any women would want. Slick, elegant design with some nice, well- paired colors, and besides this, they do the job. These gloves have a very good fit, the company’s policy is that One Size Fits All. This universal size is the best for medium to large hands. These gloves are also designed in such a way that they allow for the fluctuation of air between the inside and the outside of gloves. Because of this, you’ll never get that nasty smell that is so characteristic of any gloves that have been used for some time. They can be used for anything you want- rose pruning, trimming here and there, activities around the garden or even work in the warehouse. So you don’t have to restrict the usage of these gloves only on some garden activities- whenever you need hand protection, like when you’re carrying some heavy and inaccessible things, feel free to use them. If you’re not happy with your model, feel free to return it and get every penny that you paid for it back. The palm part is made from premium goatskin leather, will provide you with the best balance of durability and comfort. Dexterity isn’t sacrificed at the expense of sturdiness and resistance to elements. This model probably has one of the longest sleeves out there on the market. Usually, the sleeves come up to elbows, but not with this model. In this model, the sleeves will cover everything from the tip of your fingers to your shoulder! They are made from 100% leather, being highly breathable while at the same time protecting you from those nasty thorns. This product has a very wide application- you can prune roses or berries, handle cactus or all those little prickly bushes. Citrus picking also comes to mind, while these gloves will endure any hard work around the yard. In short, they will provide you with a very good grip whatever you’re working with. They come in two sizes- size M ( 7.5- 8 inch Palms) and size L (8.5-9 inch Palm). We’ve already mentioned one product that has protection stretching up to the elbows, but the one that we’ll describe now is almost unanimously rated by customers as extremely good and durable. This unisex model will protect you from any kinds of thorns, spikes or sharp object that threaten the security of your exquisite fingers. Thorns, brambles, splinter or thistles, these gloves will handle them all. Therefore, you might want to use this model with plants like blackberries, cacti, poison ivy or some other thorny bushes. The cowhide gauntlet sleeve will keep your arms nice and safe, while also allowing the skin to breathe and get the much needed fresh air from the outside. Finally, this model offers a great balance of elasticity and resistance. Unlike some other products out there, this one comes in a lot of sizes so you’ll probably be able to find the one that fits you perfectly. A lot of customers praise the characteristic that manufacturers were most confident about- these gloves really are thornproof. Usually, almost every garden glove manufacturers would say that their product is thornproof. However, Euphoria gloves are really thornproof, at least according to a lot of happy reviewers who bought them. With most offers out there, you get “only” one pair of gloves. Not with the G&F! If you opt for G&F you will get 3 pairs of gloves. They 100% cotton, assorted jersey gloves. They come in 3 colors, red, blue, and yellow, so you’ll most surely be able to choose the one that you like the most. PVC dots are printed on the palms, to assure you with a good and firm grip. 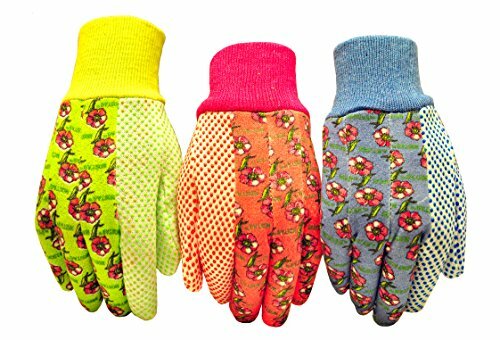 Finally, these gloves have very nice flower patterns, if you somehow forget that these are your favorite garden gloves! Considering that we’ve chosen this product as the one with the best snug fit, these comments aren’t surprising: “Warm and cute”, “ Latex-free”, etc. In short, a great majority of people who bought them find them very nice and cute. Customers also say that this product is very warm and cozy, so you don’t have to worry about getting out in harsh weather. Don’t expect this model to protect you from thorns and spikes. They are 100% cotton and sharp objects will get through them and possibly injure you. Kids can do gardening too! What’s more, they should be taught right from the beginning that work is no monster, and that, after all, to work is to live. This is why we’ve tried to find the cutest and best gardening gloves for kids. The product we’ve chosen is best for the 5-7-year-old kids, and they are foam rubber coated gloves. They come in several colors- green, red and blue- so your kid can choose his or her favorite color. The polyester seamless liner is used in the manufacture of this model to provide your kid with maximum comfort. You will get 3 pairs in one pack, so nevermind if your kid loses one or damages it. There will always be the reserve pair. We all know how children can sometimes get dirty. This is why the gloves we’ve chosen are washable. Even if your kid is particularly keen on getting them dirty, you’ll always be able to wash them. Parents are very happy with this model because thanks to it they now have an extra pair of helping hands in their gardening activities. They mostly praise the rubber coating that prevents any scratches or injuries. Others think that this is a nice gift for anyone. To conclude, this is one very nice and durable product that your kids will most surely like. This is a real all-around, unisex pair of gloves. The company that produces them, Kim Yuan, has 20 years of experience, and they select only the High-Grade leather for the production of their gloves. Made from 100% full grain cowhide, 1.2 mm thick, they will protect you from anything that hard work has to offer. You can use this product for motorcycle driving, construction, gardening, trucking, heavy work, woodcutting, camping, farm activities, garage works, etc. The list goes on and on. Because the leather is not too thick, this model is also very flexible and supple. Furthermore, they are very comfortable, partially due to the elastic wrist design, that will prevent any debris or dirt from coming inside of your gloves. Probably the thing they value the most is the ratio between the product’s price and quality. Gloves are highly resistant from pretty much everything you’ll be able to throw at them and they are quite cheap. Probably the only thing about this product that buyers find bad is the size. They mostly run small, so be careful about this when you choose the size. Finally, their color isn’t the best one, and you don’t have the option of choosing some other color. This product is entirely made from bamboo fibers, meaning that they are animal and environment-friendly. Bamboo allows for the breathing of your skin, and it absorbs perspiration. It will keep your hands warm in the winter and cool in the summer. What’s more, they are touchscreen friendly. Of course, if your gloves are clean enough for a touchscreen! Further, these gloves are resistant to abrasion. Bamboo is a natural hypoallergenic and antibacterial, meaning that it reduces the number of allergens and bacteria in the environment. What’s more, bamboo is an extremely eco-friendly plant, because it grows so fast. This product is washable. On the other hand, because due to bamboo they are so breathable, they are not that good for working around some plants that cause rashes or something like that. For example, it might not be a good idea to use these gloves when working with poison ivy. Customers are completely amazed by this product. Bamboo really helps with breathability and the dry atmosphere inside the gloves themselves. This means that you will avoid that awful smell that so often appears in most gloves. On the other hand, people have also found that these gloves don’t offer that much protection, although they provide you with a very nice and firm grip. So hold this in mind while deciding which product to buy. If you plan to do some really dangerous and possibly damaging activities with your gloves, that these gloves might not be a good choice. This product offers puncture resistance, while at the same time giving you remarkable grip and super comfort. These gloves offer protection against heat and cold, mitigate perspiration and ameliorate abrasion resistance. They are highly breathable so your hands won’t get sweaty and wet too easily. They are also machine washable. There is a lot of different sizes from which you can choose the perfect one for you. This type of gloves is meant to be just a little tighter, so it’s essential to find the size that fits you perfectly. Unless you have really big hands, you won’t have any problems with finding the right size. Whether you’re digging, landscaping, weeding, planting, picking blackberries or maintaining fruits and vegetables, this product will be your faithful companion on all these endeavors. Like some other products we’ve mentioned here, this one also comes in pairs. So if one gets teared up, or badly damaged, you’ll be able to immediately replace it. Gardening gloves are a surprisingly diverse group of products. For example, there are types that are specifically used for pruning roses, for example. This is that kind of product. It has extra long forearm protection, to keep those shart thorns away from your delicate skin. Unlike most other gloves, these have reinforced fingertips. Apart from this, you also get a knuckle guard, which completes the picture of this product as the one that offers maximum protection when working with roses. Spandex is used to achieve maximum comfort and flexibility. Also, a pattern is printed on fingertips to assure the best and firmest grip possible. Be a bit careful when deciding which size you’re going to buy because this product seemingly runs small. There are some customers that advise you to buy one size bigger than you normally would. Better safe than sorry! Apart from the criticism pointed primarily at the size and fit problem, customers are generally very content. They particularly praised the material and overall quality of the product. One customer also stated that these gloves protected him from poison ivy. It’s not easy to dig using only your hands as a tool. And this is sometimes necessary when you’re working around some small and delicate plants. You don’t want to mess around your small daisies with a big spade. So you will sooner or later be forced to roll up your sleeves and dig in with your hands. We’ve chosen this offer, for several reasons. First and foremost you receive two pairs of gloves that have digging claws attached to on the fingertips. And apart from this, you also receive two normal pairs for whatever you’re doing. This is one really funny looking attachment. Your neighbors will probably watch you a little bit suspiciously, because it may look as if you’re trying to cosplay Catwoman or something like that. However, these claws are not only there for the looks. They are made from very durable, dense ABC plastic. The gloves come in 2 colors, green and purple. There are no other colors in the offer so you might find it a bit unfortunate, especially if you don’t like these colors. Let’s say from the start that these are not your usual gardening gloves. They are mostly used for winter sports like skiing, but, due to their high quality and extremely durable material, they really have versatile and all-around use. they have premium pigskin palm and have an extremely snug fit. Add polyester knit wrist to the equation, and you have a pair of gloves that are very good in keeping warmth. The leather will keep any thorns or spikes away from your skin. With these gloves, everything revolves around keeping the warmth inside. So even the lining is done in such a way that no energy is wasted. People who bought this product are happy with the quality/price ratio. They say that, for a product that costs less than 20 bucks, they are excellent. Apart from these kinds of comments, there were people who praised their resistance to cold weather. One reviewer really stood out- he lives in North Dacota, where temperatures during the winter are extreme, and uses these gloves on a daily basis. He says, that, even on -40 C, these gloves are keeping his hands warm. We’ve already mentioned a lot of offers that include “2 for 1” or “3 for 1”. How about 12, yes 12 pairs of gardening gloves for unbelievable 15 bucks? In other words, you will pay 1.32 $ for one pair of gloves, which is, honestly speaking, a ridiculous price! They have a nylon shell for durability. This synthetic type of shell is stronger than cotton, and manufacturers say that you will be able to use the 2-3 times longer than regular types of gloves. Furthermore, this model has a nitrile coating which will provide you with the best grip possible. Nitrile doesn’t let any dust or fluids through so you won’t have to worry about that. They come in 4 colors- red, grey, yellow and red. So you will probably be able to choose the one you like the most. Most customers, while being amazed by the offer, also state that these gloves run big so it will be smart to order one size smaller than you normally would, just in case. What more can we say, the name says it all. Nomen est omen, as the Romans used to say. History aside, these pair of gloves are meant for “ General Purpose Utility”, both for men and women. They are made from heavy-duty goatskin leather so they will endure most of the challenges you throw before them. The skin is 100% natural. Soft lining, and especially the elastic wrist part will ensure maximum comfort and fit. Manufacturers say that you will be able to wear them for long periods of time without feeling a thing. You will be able to return the product if for whatever reason you’re unhappy with it, something highly unlikely to happen. Reviewers didn’t make surprising comments. They simply say that this is an ok pair of gloves that is overall very good and can even be used for some works outside the garden. For example: “I recommend these gloves for casual work”, or “ Best gardening gloves I have ever owned”. For those of you that don’t care much about veganism, animal rights issues, etc. , this product might be the right choice? Made primarily from goatskin, high-quality grade skin, they will offer you protection and resistance to most weather elements. The goatskin is soft, flexible, and yet highly durable and able to protect your hands. On the back, manufacturers have put four-way spandex, to achieve maximum flexibility and comfort. The palm is purposefully extended, and the foam is added to knuckles for even more comfort and dexterity. There is a lot of people who bought this product, which is a good sign right from the start. Some of them are completely amazed by the product’s quality and durability. Others are more skeptic and, while stating that the product itself is completely okay and does what it should, it isn’t for heavy duty work. Flexibility and comfort are also highlighted, as something that can compensate for some other flaws. One customer said that, even when you ball your knuckle into a fist, you won’t feel any pressure whatsoever. Buyers also mentioned that they are very breathable and don’t get hot or wet, and furthermore, the grip on them is impeccable. Right from the start, we’ll say that this product isn’t listed as a gardening glove or anything like that. But, as it is pretty hard to find good second skin gloves that are still resistant to scratches and protect you, we’ve chosen this product that comes from the cooking world. They have all the characteristics of your usual second skin gloves- they are extremely comfortable, offer you maximum dexterity. On the other hand, they compensate for the usual flaws most second skin gloves possess- Stark Safe Cut Resistant Gloves aren’t that easy to penetrate so you won’t have to worry a lot about getting pricked by those little nasty thorns. Its manufacturers state that this product is 4 times stronger than leather- it is made from special cut resistant material. Apart from this, they are breathable and will stay dry even after long hours of work. While most people praise its qualities, like protection, cut resistance, comfortability, extremely natural feel you get while wearing them and dexterity, there are some flaws that shouldn’t be neglected. For example, they don’t have that good grip. Objects will slip more easily, and that can sometimes be extremely dangerous, depending on what type of job you’re doing. We can all agree that it is challenging to determine the type, size, and model of best gardening gloves that you can choose based on your preferences. However, it is essential to make a quality purchase, and the best way to do it is to understand how to find the best ones on the market. We have to start by saying that not all gloves are made the same, and everything depends on the type of work you wish to handle outside. That is the main reason why you should consider the material of gloves before you make up your mind. We can differentiate numerous types of leathers that you can find on the market based on your preferences, and they range from bulky and thick to supply and form-fitting. The models with the highest quality include goatskin, which is much more durable and softer leather, it comes with puncture resistance, and it will form well with your hand. However, you should remember that goatskin leather tends to have a high price tag since this is one of the most popular choices that you can find on the market. On the other hand, people are also using pigskin for leather gloves due to their flexibility after frequent use. At the same time, they are a less expensive choice, and you will be able to use it frequently without affecting the quality of the material. Have in mind that leather gloves are the best solution that you can make when it comes to best gardening gloves that you can find on the market, and that will protect your hands against thorns. Another budget-friendly choice that will give you peace of mind is split cowhide because it is rugged and durable. Remember that cow leather tends to be thick and robust so you will be able to deal with the toughest jobs with ease. It is also convenient for wearing, and you will be able to use it for years after purchase. The main disadvantage of this particular type of leather is that it can be very unyielding and stiff, which could pose a problem for people with small hands. Apart from real leather, this particular type of material is a humanmade product that has the goal of mimicking genuine leather but with added durability. This is a popular glove material choice due to its affordable price tag, and you will be able to use it to line the palms because of durability. However, you should remember that the real thing would last much longer than synthetic skin. The main issues that could happen are that it can peel and crack after prolonged use. On the other hand, you will be able to clean it with water without becoming stiff and losing integrity. If you wish to find the most popular choice on the market that will provide you peace of mind, you should consider cotton gloves that are common due to their features. You will be able to wash them, they are breathable, lightweight and you will be able to find a wide array of patterns and colors. On the other hand, the main disadvantage of this particular glove type is the idea that you can use it for lightweight use. They are not forming fitting, and mostly, they are perfect for simple hand coverage and protection from digging and punning. However, thorns and other sharp things will easily puncture through it, so if you are working in areas filled with thorns or seed heads, you will have them on gloves with ease. If you wish to find the best gardening gloves that feature waterproof coating, which is rubber-like for both waterproofed enjoyment and reinforcement on other materials, you should choose this particular type. Finally, you will be able to enjoy in protection from moisture, elements and the additional barrier between your hands so that you can reduce the hassle of thorns and stems. Since it is not breathable, the main problem is that your hands will sweat which can cause problems and discomfort for some people. 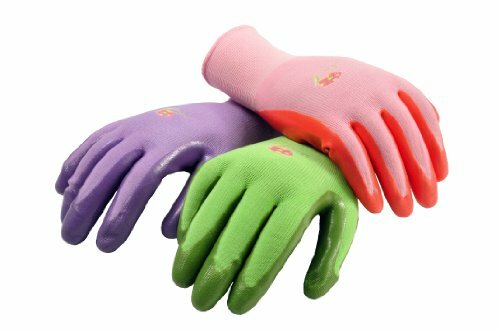 However, if you wish to find the best gardening gloves with waterproof features, nitrile coating is the best choice that you can make. Apart from these materials, we have mentioned above; you will be able to find a wide array of types and models based on specific assignments and your preferences. You can also consider spandex and lira for additional stretching, neoprene for waterproofing and durability and many more. In most cases, these materials blend with cotton with the idea to improve overall protection and comfort while increasing strength and durability. Size - The first thing that you should do when it comes to choosing the best gardening gloves for your particular requirements is to check whether they fit. Have in mind that some gloves are entirely made for smaller hands and women, while others are perfect for large hands instead. You will notice a distinctive difference between gloves that are gender labeled and the main difference is the width of the palm and length of fingers. You have to make sure that you consider this particular idea when you are looking for the best fit. Flexibility - Similarly, as we have mentioned above, some materials will provide you more stretch and flex when compared with others. When you are working with a wide array of tools, it is crucial to increase the flexibility and movement possibility. When you choose thick and protective gloves, they will be much more challenging to bend at the joints than other types and materials. The idea is to get the glove you prefer and wish to purchase and try to make a fist in it as well as spread your fingers out so that you can determine comfort levels. Wrist Closure - As soon as you decide to dig or weed, it is simple for loose materials to create havoc for you. In case that you wish to deal with plenty of groundwork, we recommend you to choose gloves that come with wrist closure. You can select adjustable Velcro straps and elastic closures, which are a great choice that will keep better fit and reduce debris from entering the gloves. Protection and Padding - If you wish to handle much more significant things than just planting and digging in your garden, the idea is to find the gloves that will provide you more than only basic protection from scratches and dirt. Working with tools, cutting and pruning can result in thorn cuts, branch punctures, and blisters. Of course, everything depends on the amount of time you decide to spend in the yard for heavy-duty assignment, but the idea is to protect yourself completely. Reinforced Fingertips - The first problem that will happen to most gardening gloves is that fingertips will tend to wear out due to constant friction. That is the main reason why manufacturers are making reinforced gloves that will provide you additional durability without affecting their comfort levels and lightweight. If you wish to use it daily, this particular extra protection is an excellent way to get the most out of it. Double Stitched Seams - The idea is to understand that seams can easily fail after a while, especially if you are using a thick material, which is not double stitched. Therefore, you should check out the quality of gloves for double stitching so that you can manually reinforce some parts so that you can improve their longevity and reduce the hassle of tearing them. That will provide you peace of mind when it comes to heavy-duty usage.